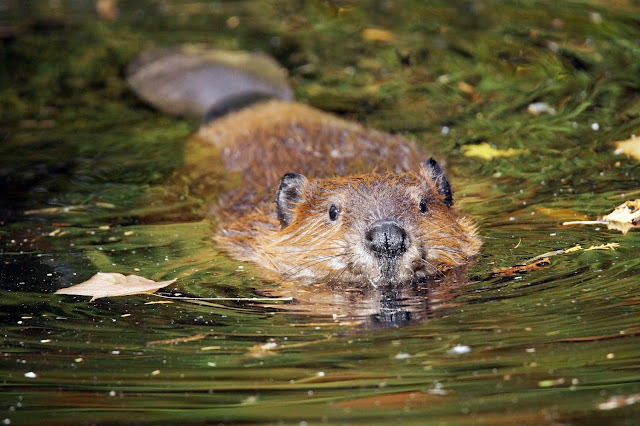 Speaking of ponds, beavers are famous for building dams on streams and making ponds that benefit the ecosystem while acting as protection for the beavers from predators. These ponds help remove pollutants in the stream and benefit wildlife. So how did the beaver help establish the USA? Hate to say it, but in the 1800s people loved beaver fur for hats and coats. If you have never felt a beaver pelt, I can tell you their fur is some of the softest I have ever felt. I do like it better on the beaver though. But back in the day before all the synthetic fur we have now, beaver pelts were at a premium. In fact the European beaver was almost extinct. They ran out of their beavers, so being the productive people we are, fur traders went out across North America. And even before that the Native Americans traded beaver pelts for goods with the Europeans. And surprise to me, beavers are still being trapped for their pelts in areas where they are overpopulated. Beavers can be a nuisance as they cut down larger trees for the dams and younger trees for food. So ends this little article on the fascinating beaver. They are an industrious animal building lodges and dams. We owe the beaver a hearty thanks for their part in settling our country. I hope you found these facts fun and you have a wonderful day.